Archbishop John was born on June 4, 1896 in Kharkov province, to the pious aristocrats Boris and Glafira Maximovitch; at baptism he was given the name Michael. Even in childhood Michael displayed a certain striving toward holiness, similar to that displayed by his distant relative, the renowned Siberian missionary Holy Hierarch John of Tobolsk, who was glorified by God through his working of miracles and the witness of his incorrupt relics. Michael was a sickly child with a poor appetite. He would take his toy soldiers and make them into monks, and the fortresses into monasteries. The Sviatogorsk Monastery, not far from the Maximovitch estate, provided the impetus for young Michael to take a seriously contemplative attitude toward life. Under the influence of the youth Michael, his governess converted to Orthodoxy. In 1914, Michael completed the Poltava Military Academy, and entered the Kharkov Imperial University school of law. He was an excellent student, although he devoted part of his time to studying saints’ lives and other religious literature. In the religious life of Kharkov, the young Michael was provided with the first step along the path of piety. In the crypt under the Kharkov cathedral church lay the relics of the Miracle-Worker Archbishop Melety Leontovitch, who spent his nights standing, with arms uplifted in prayer. Michael came to love this saint, and began to emulate his podvig [spiritual struggle] by staying awake all night. Thus, gradually, young Michael began to develop the desire to dedicate himself fully to God, and as a concomitant, began to manifest exalted spiritual qualities: abstinence and strictness toward himself, profound humility, and compassion for the suffering. Even before his departure from Russia, young Michael made the acquaintance of the Most-blessed Metropolitan Anthony (Khrapovistky), founder of the Russian Church Abroad. At the close of the civil war, Michael and his entire family emigrated to Yugoslavia, where he enrolled in the Department of Theology of Belgrade University, from which he graduated in 1925. Metropolitan Anthony came to greatly love Michael, and kept the youth near him. In 1926, Metropolitan Anthony tonsured Michael to the monastic rank with the name John (after St. John, Metropolitan of Tobolsk), and soon thereafter ordained him a hierodeacon. On the Feast of the Entry of the Most-holy Theotokos into the Temple, monk John became a hieromonk. In 1929 he began to teach at the Serbian high school, and soon, with his capacity for inspiring lofty Christian ideals in his students, won their love. As a hieromonk, John continued to practice the podvig of strict asceticism, to which he joined a podvig of all-night prayer, a podvig beyond the capacity of most people. It was during this time that, at the request of local Greeks and Macedonians, he began to serve in Greek for them. Like Holy Righteous John of Kronstadt, Vladyka served the Liturgy daily, acquiring thereby great spiritual strength, and having fanned within him the flame of love for God and for men.Hieromonk John began to visit hospitals and to search out the sick, those in need of prayer, consolation, and Communion. Inasmuch as Hieromonk John’s renown was constantly growing, the bishops abroad resolved to elevate him to the episcopate. Wishing to decline such a lofty calling, Hieromonk John emphasized the fact that he had a speech impediment; the bishops remained unmoved, pointing out to him that the Prophet Moses had also had a speech impediment. Hieromonk John’s consecration, and his assignment to the Diocese of Shanghai, China, took place in May 1934. The newly-consecrated Vladyka arrived in Shanghai at the end of November, and immediately made efforts to restore church unity. He established ties with the local Orthodox Serbs, Greeks, and Ukrainians. At the same time, he began the work of erecting a huge cathedral church dedicated to Surety of Sinners Icon of the Mother of God, as well as a three-storey parish house and bell tower. Gifted with boundless energy, Vladyka John served as the inspiration for the building of churches, hospitals, and orphanages, and played an active part in many benevolent undertakings in Russian Shanghai. But despite such frenetic activities, Vladyka John continued to live as if in another world. In order to avoid secular glory and human praise, he from time to time pretended to act the fool. He remained in constant prayer, and if he did not serve in the church, then he would read the daily cycle of services himself. Often Vladyka would walk barefoot, even on the coldest of days. He would eat once a day, and during the fasts of the church would eat nothing by prosphoras. Each morning, to quicken his spirit, he would pour cold water over himself. He did not make social visits, but those in need of help he would visit, at unpredictable times and in bad weather. He would visit those he knew to be sick on a daily basis, taking with him the Holy Gifts. He possessed the gift of clairvoyance, and the gift of powerful prayer. There is documented a multitude of instances in which miraculous help came through the prayers of Vladyka John. In 1939, a certain parishioner, beset by a number of tribulations, began to lose her faith. Once, upon entering the Church while Vladyka was serving, she witnessed a flame, shaped like a large tulip, descend into the Chalice during the consecration of the Holy Gifts. After seeing this miracle, her faith returned to her, and she repented of her faint-heartedness. It once happened that as the result of constantly being on his feet, Vladyka’s leg became very swollen, and the physicians, fearing the possibility of gangrene, prescribed that he be hospitalized. After much pleading with him, they succeeded in talking Vladyka into entering the Russian Hospital. But he did not remain there long. The same evening, he secretly left and went to the cathedral, where he served the All-night vigil. By the next day, the swelling had completely gone. Vladyka used to visit prisons, and he served the Liturgy for those underSt.John of Shanghai and San Francisco, Mural, NW side of our cathedral arrest. Often, upon seeing Vladyka, the spiritually ill would become calm, and would piously receive Communion. Once, Vladyka John was asked to commune a dying patient at the Russian Hospital in Shanghai. On that occasion, Vladyka took a priest along with him. Upon their arrival, he noticed a gregarious young man of about 20, playing a harmonica The lad was to be discharged the following day. Vladyka John called to him and said: “I want to give you Communion right now.” The young man immediately confessed his sins and received Communion. The astonished priest asked Vladyka why he had tarried with an apparently healthy young man instead of going to the one who was dying. Vladyka answered: “He will die tonight, and the other one, who is seriously ill, will live for many years.” And so it came to pass. An enormous feat of charity was Vladyka’s building in Shanghai of an orphanage to serve orphans and needy children. At first, there were only 8 orphans living there, but over the years, the orphanage gave shelter to hundreds of children, with an overall total of 1,500. Vladyka himself gathered up ailing and starving children from the streets of the Shanghai slums. It once happened that during the war, there was not enough food in the orphanage to feed the children. Vladyka prayed all night, and in the morning, the doorbell rang. The representative of some charitable organization had brought a substantial donation to the orphanage. During the Japanese occupation, Vladyka declared himself to be the temporary head of the Russian colony, and showed great courage in defending Russians before the occupying Japanese powers. In Shanghai, there was a voice teacher named Anna Petrovna Lushnikova who taught Vladyka proper breathing and enunciation, thereby improving his diction. At the end of each lesson, Vladyka paid her $20.00. During the war, in 1945, she was gravely wounded, and happened to be in a French hospital. Sensing that she might die during the night, Anna Petrovna begged the nurses to call Vladyka John, so that he might give her Communion. Because, as the result of war-time conditions the hospital was locked up at night, the nurses refused. On that stormy night, Anna Petrovna was beside herself, and kept calling upon Vladyka. Suddenly, about 11:00 PM, Vladyka appeared in the ward. Unable to believe her eyes, Anna Petrovna asked Vladyka whether she was dreaming or whether he had actually come to her. Vladyka smiled, prayed, and administered Holy Communion. Afterwards, she calmed down and slept. The next morning she felt healed. As the hospital had been tightly secured, no one believed Anna Petrovna’s report that Vladyka had visited her during the night. However, a patient in a neighboring bed confirmed that she had also seen Vladyka. The greatest surprise was the discovery of a $20 bill under Anna Petrovna’s pillow. In this way, Vladyka left material evidence of his visit. With the coming of the Communists to power, the Russians in China were once again forced to flee, most through the Philippine Islands. In 1949, approximately 15,000 refugees from the Chinese mainland were living in a camp on the island of Tubabao. Every night, he made a circuit of the island, and by his prayers and the sign of the Cross, protected the island from the seasonal typhoons , something acknowledged by the Filipinos themselves. By the lobbying efforts of Vladyka in Washington, a law regarding Russian refugees was amended, with the result that many Russians were permitted to enter the United States. It was during this trip to Washington in 1949, that on September 11th, the Feastday of the Beheading of St. John the Forerunner, Vladyka founded our parish. In 1951, Vladyka was appointed to head the Diocese of Western Europe, with his cathedra in Paris. Vladyka expended great efforts to unite to the Church Abroad parishes of the French Orthodox Church, and he helped establish the Orthodox Church of Holland. Vladyka turned his attention to the existence of local saints who had lived in antiquity but who were heretofore unknown to the Orthodox Church. At his initiative, the Synod passed a resolution with respect to veneration of a host of saints who had lived in the West prior to the schism of 1054. Vladyka was constantly travelling across Europe, and he sometimes would celebrate the Divine Liturgy in Dutch, in French; later he also served in English. Many revered him as an unmercenary-healer. "Since for a long time our church did not have a permanent priest, once a priest from another parish came to us to celebrate Vespers. The whole service lasted only 45 minutes (usualy it takes 2 and a half hours)! We were horrified! So many parts of Vespers were skipped that we decided to tell about this to Vladika. We hopped that he will influence the priest to follow the established order of Orthodox services. But Vladika pleasently smiling said to us: `How difficult is to please you people. I celebrate too long and he too short!' With such kindness and meeknes he taught us not to judge." Vladika's reputation for holiness, too, spread among the non-Orthodox as well as the Orthodox population. In one of the Catholic churches of Paris, a priest strove to inspire his young people with these words: "You demand proofs, you say that now there are neither miracles nor saints. Why should I give you theoretical proofs, when today there walks in the streets of Paris a Saint - Saint Jean Nus Pieds (Saint John the Barefoot)." Many people testify to the miracles worked by the prayers of Archbishop John in Western Europe. V. D. recounts: "Many were aware that it was not necessary to ask Vladika to visit someone. The Lord Himself inspired him where and to whom to go. Vladika John was known to many in the French hospitals and was admitted therein at any time. Besides, Vladika unerringly directed himself where he was needed. My brother, when wounded in the head, was taken to the hospital. The x-ray revealed a large fracture of the skull. His eyes swelled and became sanguinous; he was in critical condition. Vladika, who did not know my brother, somehow found him in the hospital, prayed over him and gave him communion. When my brother underwent a follow up of head x-rays, there was no fracture to be found. My brother recuperated very fast. The doctor was dumbfounded!" The Beatitudes contained in the Gospel are sequentially linked to one another, and conclude with a reward for enduring abuse and persecution for the sake of the Truth. Toward the end of his days, the time came for Vladyka John to endure many sorrows. These reached him while he was yet in Brussels. From his spiritual children in San Francisco, he heard the sad news that dissension had appeared in their cathedral. 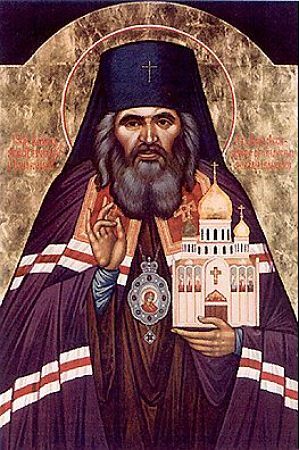 At this time, Vladyka John’s long-time friend Archbishop Tikhon of San Francisco, had retired. In his absence, the building of the cathedral was brought to a halt, and bickering paralyzed the community. In response to persistent requests by thousands of Russian parishioners in San Francisco, the Synod appointed Archbishop John to the San Francisco cathedra, so that peace might be restored and the construction of the cathedral completed. Vladyka arrived in San Francisco, that eternally foggy city of the far West, in the Fall of 1962. Under Vladyka’s direction, peace was restored, the majestic cathedral in honor of the “Joy to all Who Sorrow” Mother of God was erected and decorated with gold cupolas. But things were not easy for Vladyka. He was forced to meekly and silently endure a great deal. He even had to appear in public court to answer absurd charges of financial irregularities by the Parish Council. All the truth triumphed, Vladyka’s last years were filled with the bitterness of slander and persecution. Accounts of several instances of Vladyka’s miraculous assistance during this final period have come down to us. We will cite just a few stories. Anna Hodyriva recounts: "My sister Xenia Yarovoy, who lived in Los Angeles, suffered for a long time with a painful hand. She sought physicians, tried home remedies, yet nothing helped. She finally decided to turn to Vladika John and wrote to him in San Francisco. Some time went by and the hand was healed. Xenia began to forget about the previous pain in her hand. On one occasion, when she visited San Francisco, she went to the Cathedral for services. At the end of the service Vladika John held the cross to be kissed. On seeing my sister he asked: `How is your hand?' Vladika saw my sister for the first time! How then did he recognize her and know that it was she who had a painful hand?" Anna S. recollects: "My sister Musia and I got into an accident. A drunken young man was traveling towards us. He struck with great force the door on the side where my sister was sitting. The ambulance was called and she was taken to the hospital. Her condition was very serious — a lung was punctured and a rib broken, which caused her great pain. Her eyes were invisible in her swollen face. When Vladika visited her, she lifted her eyelid with her finger and upon seeing him took his hand and kissed it. She could not speak since she had a tracheotomy, but tears of joy flowed from her eyes. After that Vladika visited her several times and she began to get better. Once Vladika entered the ward and announced: 'Musia is feeling very poorly now.' He then went to her and, closing the drape around her bed, he prayed for a long time. During his prayer we were approached by two physicians and I asked them how serious was my sister's condition and if I should summon her daughter from Canada? (we kept from the daughter the fact that her mother was in an accident). The physicians answered: 'To call or not to call the family is your problem — we cannot guarantee that she will survive until the morning.' Thank God that she not only survived that night, but was completely cured and returned to Canada … My family and I believe that Musia was saved by the prayers of Vladika John." Vladika's life was governed by the standards of the spiritual life, and if this upset the routine order of things it was in order to jolt people out of their spiritual inertia and remind them that there is a higher judgment than the world's. A remarkable incident from Vladika's years in San Francisco (1963) illustrates several aspects of his holiness: his spiritual boldness based on absolute faith; his ability to see the future and to overcome by his spiritual sight the bounds of space; and the power of his prayer, which beyond all doubt worked miracles. Several people have asserted that Vladyka John know of the time and place of his death. On June 19, 1966 (old style calendar), Vladyka accompanied the Miraculous Kursk-Root Icon to Seattle, there celebrated the Divine Liturgy, and then spent 3 hours alone in the altar with the Icon. With the Icon, he visited his spiritual children who lived near the cathedral, and, then, proceeded to the room in the parish house where he was staying. Acolytes sat Vladyka down in the chair, and saw that he was already dying. Thus did Vladyka give up his soul to God before the Miraculous Icon of the Mother of God of the Sign. Metropolitan Philaret was the principal celebrant of Vladyka’s funeral service. For six days, Vladyka lay in his coffin, and despite the heat, no smell of corruption was evident, and his hand remained soft. Vladyka rests in a crypt chapel of the San Francisco Cathedral. In 1994, a special commission for the glorification of Vladyka John discovered that his relics were incorrupt. On July 2 (new style calendar) of that same year, the blessed founder of our parish was glorified as one of the Holy Worthy Ones of God. Soon after his repose, a new chapter began in the story of this holy man. Just as St. Seraphim of Sarov told his spiritual children to regard him as living after his death, and to come to his grave and tell him what was in their hearts, so our Vladika also has proved to be hearing those who revere his memory. Soon after his death a one-time student of his, Fr. Amvrosy P., saw one night a dream or a vision: Vladika, clad in Easter vestments, full of light and shining, was censing the cathedral and joyfully uttered to him just one word while blessing him: "happy." As during his life time, Vladika continues to be very active in helping those who need him. Here are just two of the thousands of cases of Vladika's miracles. Victor Boyton, who witnessed the healing of his friend by Vladika John, recounts: "The miracle occurred after I had received the copyright to the English publication of Orthodox Life from Jordanville, N.Y., which included photos of Vladika John. I had a friend, a Moslem from Russia, who was suffering from cancer of the blood and was losing his sight. The doctors concurred that in three months time he would be blind. Placing the picture of Vladika John by my vigil light, I began to pray daily for my friend. After a short period of time my friend was healed from the blood cancer and began to see normally. The eye doctors were amazed at this occurrence. From then on, my friend has lead a normal life and reads without impediment." The archpriest Stephan Pavlenko recollects: "My brother Paul, although not in the military, lived for some years in Vietnam. There he sought children who were wounded or orphaned due to the then continuing war. He placed them either in orphanages or hospitals. Thus he became close with his future wife, a certain Vietnamese Kim En who was also involved with helping the unfortunate children. My brother introduced Kim to the Christian faith and to the lives of many of God's Saints. She told my brother that during her very difficult times there appeared to her in her dreams a certain monk who consoled her and told her what to do. Once, towards Easter time, I sent my brother some cassettes of monastic songs as well as some books and journals of a spiritual context. Having received my parcel and having shown the spiritual literature to Kim he was surprised, when upon seeing the cover of a certain journal she exclaimed: `This is the monk who appears to me in my sleep!' She pointed to a well known picture of Vladika John, taken among the graves of the Novo Diveevo monastery in Spring-Valley. In suit, Kim was baptized in the Orthodox Church with the name Kyra." By prayers before his incorrupt relics, people are strengthened in faith, andMosaic over the NW entrance to the Cathedral. receive healing, consolation, and spiritual powers. After the many struggles, cares, sorrows which he endured for the sake of Christ and His Truth, Holy Hierarch John has arrived at the peaceful heavenly harbor, where rejoicing together with the angels, he glorifies the Father and the Son and the Holy Spirit, God One in Trinity, to Whom from us as well may there be glory, honor and worship, now and ever and unto ages of ages. Amen.